Lord, I know I am a sinner and I need a Savior. I believe Lord, that You sent Your Son Jesus who died on the cross and rose from the grave to pay for my sins. I ask You to forgive me of my sins come into my heart and give me eternal life. I ask this by faith. Amen. Contact us to gain a deeper understanding of life through biblical counseling. 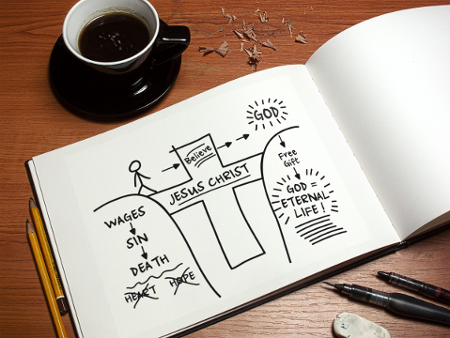 HOW CAN WE BE SURE WE ARE SAVED & HAVE ETERNAL LIFE? WHY MUST WE FIRMLY MAINTAIN THE DOCTRINE (UNDERSTANDING) OF JUSTIFICATION BY FAITH? It is the chief belief of Christianity. It distinguishes Christianity from false religions, all of which teach salvation by works. It gives enduring comfort to those truly repenting for their sins. It gives all glory to God.